Courtney Milan has done it again, and this may actually be my favorite book yet by her. Plenty of romance novels have funny moments, but it’s rare that I actually have to set a book down because I’m laughing so hard there are tears streaming down my face. If you’ve spent any time on ladyblogs, you’ll love it too. While The Suffragette Scandal is the fourth full book in the Brothers Sinister series, the brothers aren’t the focus (though they do pop up here and there). Instead, we finally get Frederica “Free” Marshall’s story. Free is the titular suffragette; she publishes a newspaper called the Women’s Free Press, which is by, for, and about women, and given how well publications of that sort are received today by some misogynistic assholes, you can just imagine how well it goes over in 1877. Unfortunately, Free has to deal with more than just angry letters to the editrix—she has a powerful enemy in James Delacey, the presumed heir to a viscountcy following the death of his father and the disappearance of his older brother nearly seven years ago. Some guys never forgive a woman who refuses to sleep with them. In a chance encounter, Free meets Edward Clark, a scoundrel who nevertheless wants to help her protect her paper from Delacey’s attacks. Edward is actually James’s long-lost brother; he has no interest in assuming the title of Viscount Claridge, but he hasn’t forgiven his brother for telling the British Consulate in Strasbourg that he was an impostor, which meant he was stuck there for a siege during the Franco-Prussian War. Edward initially comes to Free’s assistance because he learns that James is also targeting Stephen Shaughnessy, the younger brother of Edward’s childhood best friend who writes the Dear Man column in Free’s paper. As James’s attacks move from just trying to discredit Free to actually putting her life in danger, Edward realizes that he’ll do anything to save her, even if it means that she may never forgive him when she discovers who he really is. If I were a woman, I would have to cite examples of rational thought on the part of women, which would be awfully tiresome. Once we got through the example of the ancient Greeks, matriarchal rulers in China, Africa, and our own country, once we passed from Aglaonike the astronomer, to Cleopatra the alchemist, and on through our very modern Countess of Chromosome, we’d scarcely have time to talk about how great men are. That simply won’t do. Luckily, I am a man and so my mere proclamation is sufficient. Women can think. This is true because a man has said it. I can’t even tell you how happy I am that Stephen’s getting his own novella to finish up the series. I love him. There’s also a very sweet love story between Amanda and Miss Johnson, the secretary to Jane’s sister-in-law. Straight historical romances rarely venture into gay or lesbian territory unless it’s for shock value or to give an excuse to break an arranged marriage, so it was nice to see it play out. While I occasionally wanted to throttle Edward for his stubborn tendency towards self-sabotage, his actions make sense once he reveals more details about what happened in his life while he was presumed dead in Europe. He worries so much about what his true identity will mean for Free, but can he figure out how to make their situation work so she gets her happily ever after? You’ll have to read to find out! Disclosure: I received a promotional copy of the book via NetGalley in exchange for my honest review. This review originally appeared on Cannonball Read. 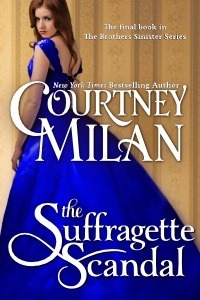 This entry was posted in Books and tagged #cbr6, brothers sinister, cannonball read, Courtney Milan, crosspost, historical romance, The Suffragette Scandal. Bookmark the permalink.